Inexpensive Stocking Stuffer Ideas for Christmas. 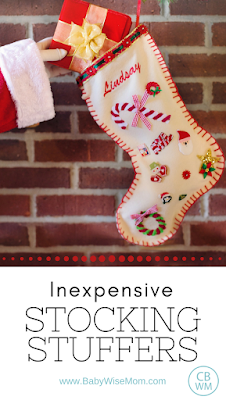 A list of ideas for stockings for children. 17 different items you can use as stocking stuffers this Christmas. Do you know what I reeeeaaalllly dislike in my house? The cheap little toys you get that end up breaking in a day. A lot of those types of toys are obvious candidates for a stocking stuffer. 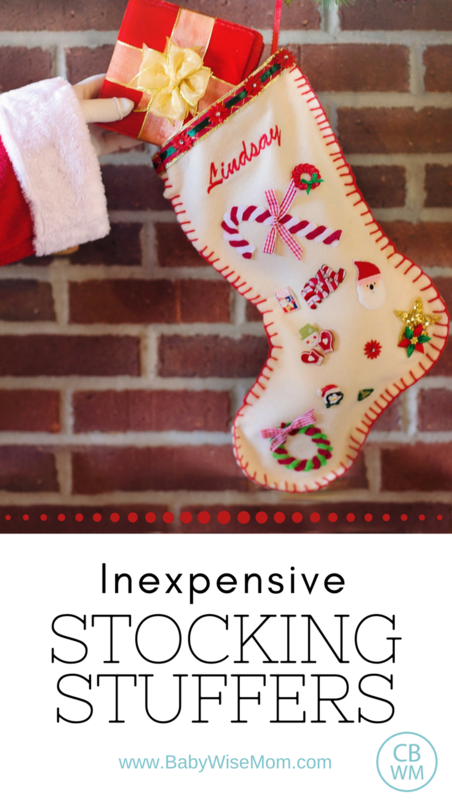 You can fill a stocking up fast and inexpensively! I can’t bring myself to be the source of the cluttery toys, however. I also can’t bring myself to spend a thousand dollars on stocking stuffer items (I exaggerate…a little). I want stocking stuffers that are useful, inexpensive, and I won’t want to throw away the next day. Notebooks come in all sorts of sizes, so no matter the size of your stocking, you can find a notebook to go in it. Notebooks are also very inexpensive. Check the dollar store and other local stores you like to turn to for inexpensive notebooks. Our dollar store also has nice drawing pads. Always price check against Amazon, also. Along the same line, if your child enjoys coloring in coloring books, those are fun stocking stuffers. Not all of my children have been into coloring books, so it isn’t something I have always used, but I do have some who love to color in a coloring book. Be sure to look at Amazon for some good deals on coloring books, especially the adult coloring book style. They have a lot of options for under five dollars. I am not kidding. My kids think they are in heaven when they pull out Post-it notes. A whole pad they can use however they want to! You can get them at the dollar store or often somewhere like Walmart or Target for even less than the dollar store. You can often find good deals on a package of post it notes that you can then split up among your children. Yes, tape. Once again, thrilled children. This is tape they can use however they want. It is really a gift for me, because they don’t use up all of my tape. I often find this is least expensive at Walmart. We always do scotch tape and sometimes do duck tape. More joy from my children. You can get a package of any of these for pretty cheap. My kids love to get their own package of pens that they can use up and take wherever they want to. My kids love to get the “click” pens since that is what I typically use and don’t allow them to steal from me. You can get really inexpensive calendars, journals, and planners at the dollar store. There are also a lot of fun finds on Amazon, depending on what you want out of these things. Stickers are very inexpensive and a thrilling addition to the stocking. Fun, simple bath toys can be nice for the stocking. If you haven’t tried bath paints, you need to try it out! If there are some items my child needs, I will totally throw it in there to help take up space. Yes, I have done socks and underwear in the stocking before. As long as it isn’t the ONLY thing in the stocking, they don’t mind. My kids all actually get excited about new socks. This category could also be a pair of pajamas or some slippers. Girls love to get these self-care items in their stockings. These double as needed items, but are practical. Boys don’t usually find these types of things as exciting, but they can absolutely be tossed in the stocking. We always do Lip Smackers in the stockings. You can get a lot of nail polish for around a dollar. These can be great for a stocking stuffer, along with other nail things like nail stickers and nail files. There are a lot of inexpensive, fun games you can add to a stocking. When Brayden was little, he loved Hot Wheels cars. Hot Wheels cars are not expensive at all, but they are still great toys. If your child has a favorite type of toy that has some inexpensive options, those are great additions. A small Beanie Boo or a small LEGO set are also great options. If you wanted to buy a big package of Hot Wheels to get them cheaper, ask a friend if she wants to go in on it together and split the cars up. Another ideas is to save some for Easter baskets or birthdays. I don’t usually put much candy in the stockings. I sometimes do a candy-cane shape container full of a certain type of candy. Adding candy can b a great, inexpensive filler. Don’t forget to consider gum in your list of candy options! When I had babies, I would put a package of the Gerber Puffs in my baby’s stocking. Adding an ornament to the stocking is a fun tradition if you don’t have ornaments going on some other time already. I usually put one “big” item in the stocking. That is usually a movie or video game.